Easy Roll Up Door Kit ! Stops your door in any position. Simple 10 minute clip on Installation, complete hardware and bottom pipe included. All parts are weather resistant which prevents jam ups at the top because of freezing or rust. 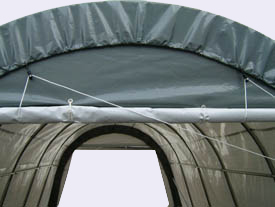 Works on all sizes of any shelter. Includes Rope and Pulley system. Door Rolls Inside or Outside and Looks Great! 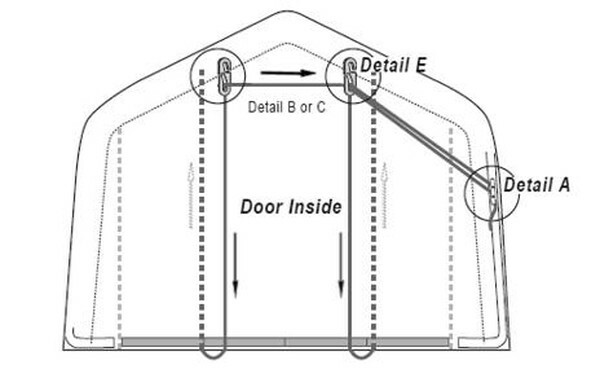 If you have a unit with a triple zipper front door you will need to purchase two roll up kits. One for each side. Please note the kit does not include the zippered panel.